To What Benchmark Should I Compare My 2016 Returns? For most investors, the return of the S&P 500 Index is considered the return of “the stock market.” The S&P 500 index was up 11.96% for the year. But it is best not to think of the return of the S&P 500 as equivalent to the return of stocks. The S&P 500 represents Large-Cap US stocks which is just one half of one asset class. In recent years, the S&P 500 has appreciated more than other stock categories. In other years, the S&P 500 has underperformed those same stock categories. This year, the S&P 500 underperformed Mid-Cap Value and Small-Cap Value as you can read about in our article “US Stock Investing in 2016.” It outperformed other developed countries. And it underperformed emerging markets. Investors always want to compare the return of their portfolio against some benchmark index. We suggest not using the S&P 500 for that purpose. It is a good benchmark for the US stock asset class, but not for stocks as a whole. The best measurements of “the stock market” is to measure the return of all stocks in the world, large and small, developed countries and emerging markets, in exactly the proportions that they are valued in the world. The MSCI All Country World Index does exactly that, and it had a return for the 2016 year of 8.48%. Any decision to deviate from investing like this index is a choice. Tilting domestic or international is a choice. Overweighting small or value is a choice. Emphasizing resource stocks is a choice. And the MSCI All Country World Index is a good benchmark to compare those choices against . A very similar index is put out by the Financial Times Stock Exchange (FTSE) called the FTSE Global All Cap Index which had a 2016 return of 8.82%. The two indexes are very similar. You can buy a single ETF based on the FTSE index and own every stock in the world by buying the Vanguard Total World Stock ETF (VT). By using an all-world index as a benchmark, you are comparing your portfolio choices against the simplicity of investing in something like this one ETF. For our index 2016 stock index, we are going to use the MSCI All Country World Index with a return of 8.48%. If 8.48% represents the return of all stocks in the world, what about bonds? Most portfolios are comprised of both stocks and bonds. 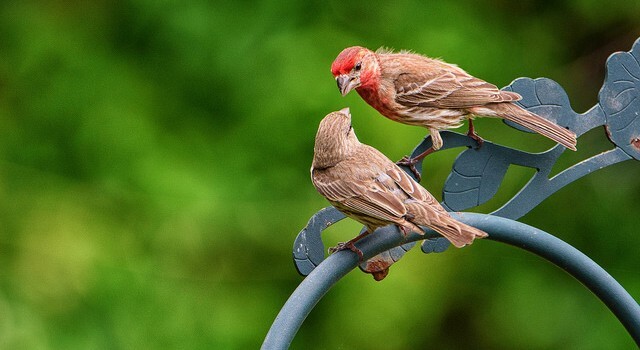 In our article “Your Asset Allocation Should Be Priceless,” we demonstrated the importance of having a bond allocation appropriate to your withdrawal rate in order to maximize the chance of not running out of money during your retirement. If your portfolio includes bonds, you shouldn’t compare your portfolio’s returns against an all-stock index. Instead, you should blend an index which includes a very stable fixed-income portfolio such as the One-Month Treasury Bills index. Decisions to take more risk than the One-Month Treasury Bills index should be judged against this type of stable index. You invest in fixed-income because you want stability. You will need that money in the next several years and if you wanted to take risk, you would have invested it in stocks, not bonds. 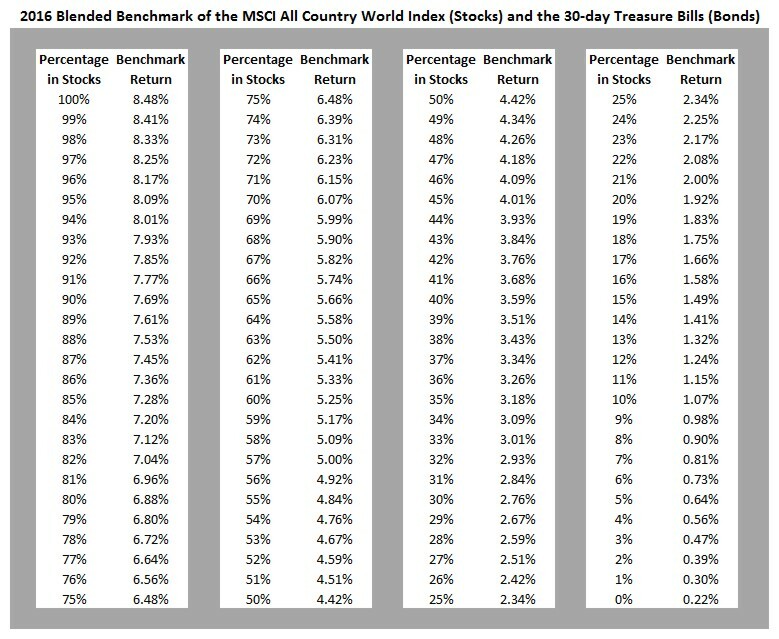 To find an index of your portfolio, determine the percentage of your assets you have in stocks and, assuming that the remainder of your portfolio is in cash or bonds or other fixed-income, use the following table to look up the 2016 blended index where the stock percentage is represented by the MSCI All Country World Index and the bond index is represented by the One-Month Treasury Bills index. For example, if your portfolio is 70% stocks and 30% bonds and cash, your 2016 blended benchmark return would be 6.07%. What Benchmark Should I Measure My Return Against?